Distributed call-center outsourcing service LiveOps has launched Livework, new venture that uses crowdsourcing to manage and implement a workforce in the cloud. Livework lets businesses outsource process work to distributed teams of experts and agents, all in a dynamic, on-demand environment in the cloud. Livework is basically a marketplace for outsourcing projects. Any client can advertise the need for virtual work on the platform and work providers can find projects or advertise their services on the site. 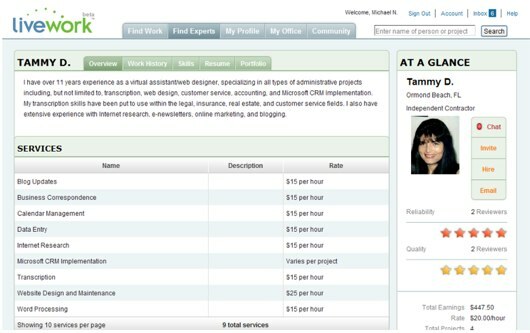 Companies can operate virtual service storefront, and can bid for workers. Each worker’s profile includes information about their work history, reputation etc. Launched a few months ago, Livework’s marketplace is powered by Liveops’ 20,000 U.S. home based telephone workers. Their service operates as a performance based auction, routing incoming calls to the best performing worker available. Livework uses the results-based routing to schedule works. The top agents make three times more than the average agent. Liveops says the the marketplace is getting about 3,000 applications for work per week but only 50 agents are accepted per week. Businesses can have real-time visibility on work progress on the platform and have the ability to create reports at any time. Liveops takes a cut of the money a business pays to outsourcers. It seems that Liveops is launching this service in an environment that is ripe for the offering. More and more companies are looking to the cloud as a platform for operations and Liveops is offering a place for workers to find work in an economy where unemployment rates are peaking. 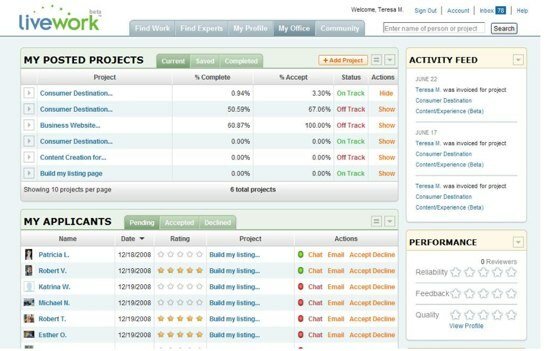 Competitors to Liveops include Skyclick and oDesk.